ah, i am posting an eggplant recipe today, made on the spur of the moment much like yours - the dilemma in my case was associated with "what to cook for dinner?" though. kalanda sadam looks gorgeous, i love anything with eggplant. My blogosphere sister... my lunch is capsicum rice today :-) with curd. This is so simple and looks yum! simple and tasty!good meal for brinjal lovers like me!! Lakshmi, Rice is only for lunch. Dinner-ku tiffin thaan. Sister Raaga ;). While you are at it, check out Shammi's Sesame rice. Its awesome. Shyamala, Give eggplant a try. I suggest you start from rasavangi. yeah, i wudnt mind that either :D and may i tell you one more time that i am in love (totally and completely) with your pics? DO you use photoshop? suganya...thats one yummy looking dish...you make the picture take life...great job...am sure it must've been yummy..
Suganya, yes one pot meals come in handy anytime and one made with eggplant is great anytime. Those colorful carrots look gorgeous. first i thought its vangi baath. beautiful pic. did u use small purple egg plants here? What a pretty looking eggplant rice! That is a great idea. I could definitely use it. Suganya its always a visual treat visiting your blog. Lovely colour and those carrots looks so cute. This recipe is awesome and as always the picture is gorgeous. Just love visiting ur blog. I use Photoshop Elements for all editing purposes. A good picture requires good photographer, more than a good camera. So you will get it. It just takes some time and know-how. Looking back, I don't like some of the pictures I have taken earlier. Try reading some books on photography-basics. That should help you. All the best :). Thank you Sri, ISG and Laavanya. Sia, Those are small, purple, Indian eggplants. Asha, Rainbow carrots are so pretty. Thanks to an enthusiastic farmer in the market. Looks so much like vangi baath. I was planning to do vangibhaat tonight. Nice recipe and picture. Presentation of the rainbow carrots looks so good. I completely agree with your first paragraph! i love eggplants! Those rainbow carrots look really pretty! Looks delicious Suganya. We make something similar - vangibhaat - i'm sure u know of it. And these mixed rices are such a savior - are'nt they? Love u're version, so simple. Came in through Savithri's blog (her mom). I too like Latha call it vaangi bath. One version I try is to cook the brinjal in the microwave covered by a plate for two minutes and then add it to the rice. The dhals are fried and powdered and added to the rice with a good amount of coriander powder and coconut! suganya.. nice touch with those carrots.. the pics look amazing..fresh and clear. on another note...i was a little dissapointed with yellow carrots.. tasted the same as the red/orange ones huh!! Suganya, I am so with you on this quick dish. You know how many veg-rice combos I've come up with. Your curry and eggplant rice is stunning to look at and I can just imagine how good it tastes. That shining eggplant looks nice Suganya. I have made vangibhath only twice..urs looks very tempting. noted down the recipe. thanks. Kribha, This is not the traditional vaangi baath. But its quite worth the try. Priyanka, Do let me know how it turned out! Musical, The rainbow carrots are pretty. That was the first thing that caught my attention when I entered that stall. Rajitha, What do you expect a carrot to taste like? Greedy you are :p. Do you know carrots were originally purple in colour and were later changed to orange by Dutch, as it is their national colour? Sandeepa, This is not Vaangi baath. I can post the recipe if you want. 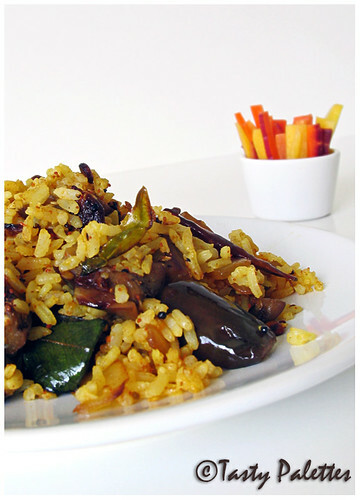 Lets say this is one other version of eggplant rice! Rainbow carrots sounds interesting! Your rice looks delicious. I count on mixed rice too as a lifesaver...I love eggplants...the rice looks gorgeous. Love your rice. I heard so much of eggplant rice on the blogworld that I had a colleague who is from Tamilnadu to have his mom make some authentic vengai rice (I hope I am correct) for me. It tasted delicious. Now its my turn to try out. Thats a simple,but tasty kalandha saadam. I made this rice and love for the simplicity! Thank you Suganya!